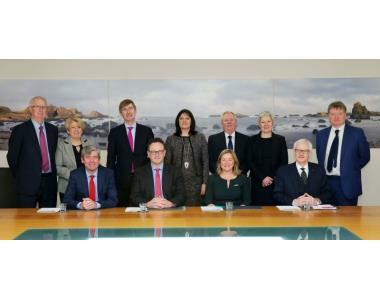 The offices of the Law Society of Northern Ireland in Belfast were the venue for a meeting of the Four Jurisdictions attended by the Presidential and Chief Executive Teams of the Law Societies of Northern Ireland, England and Wales, Scotland and the Republic of Ireland. The regular meeting was held in Belfast to discuss issues affecting the solicitor branch of the legal profession and to explore areas of mutual interest. The President of the Law Society, Ian Huddleston welcomed his colleagues to Belfast. "We are delighted to be hosting the meeting of the 4 jurisdictions in Belfast and to welcome the Presidents and Chief Executives from the Law Societies of England and Wales, Scotland and the Republic of Ireland. Today's meeting provides an opportunity to discuss issues of importance and commonality to the solicitor profession in each of the 4 jurisdictions and to build the strong working partnerships with our colleagues in each of the four Law Societies".